Despite all odds, the 26th Ohio and 13th Michigan of Buell’s brigade manage to rally and counterattack the advancing Confederates. 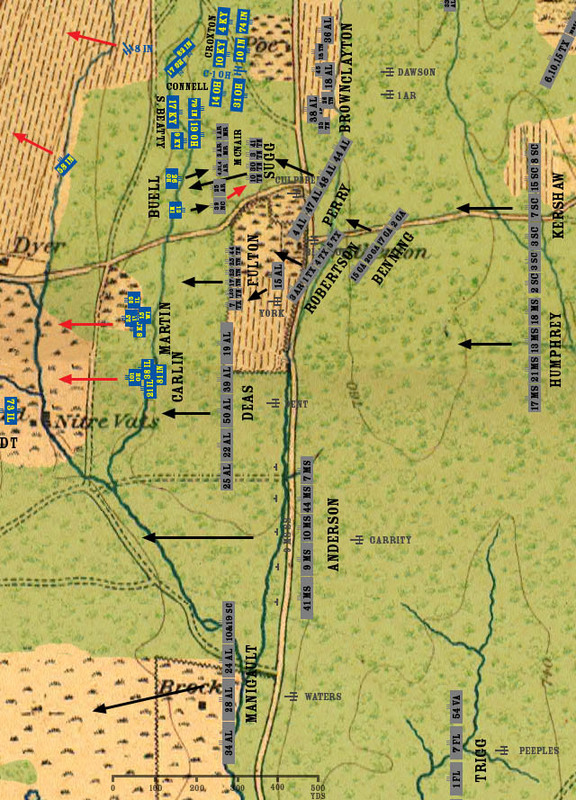 McNair’s Brigade is stopped, and Sugg’s brigade has to pass through its lines to continue the attack. Hood’s Division enters Brotherton Field, and begins wheeling to the right. The 15th Alabama of Perry’s brigade separates from the rest of the regiments and continues moving west and southwest. The brigades of Deas and Fulton continue west in pursuit of Davis’ routed Federals. Kershaw’s division finishes deploying and begins its advance.